The CregorNews.com Springcamis back for an amazing 7th year. 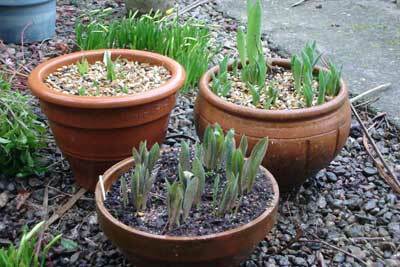 This year again see's two types of Tulips, and one of Daffodils growing in the Terrocata pots. The tupils chosen for glory this year are 'Ile De France', and 'Orange Brilliant'. The Daffodils are 'New Baby'. after i fed them regularly with the 'Liquid Gold' fertilizer from the wormery.